Boats bob on the ocean as the sun goes down and later in the darkness the lights of the Whitsundays twinkle in the distance. This is the experience at the Déjà Vu as you dine under the stars overlooking Airlie Beach. This is tropical sea view dining. Owners, managers and chefs, Sarah and Patrice Duverger, invite their guests to enjoy pre-dinner drinks in the luxurious lounge before taking their seats at this boutique restaurant serving modern Australian cuisine. The seasonal menu offers what’s best from the region, and that includes fresh seafood, vegetables and divine desserts. The views from the terrace are particularly special, but for those extra special occasions, a secluded Balinese Hut in the grounds is where couples can enjoy and intimate dining experience. Déjà Vu is also a lunchtime venue. Dine under cover or alfresco by the pool and enjoy seasonal fresh seafood, innovative salads, gourmet panini, speciality dishes and freshly made desserts. In addition to the food, guests are welcome to enjoy the 10 metre wet edge swimming pool before they eat. Wednesday to Saturday, lunchtimes are a place to relax and enjoy the views. But Déjà Vu has a tradition, and that’s a gastronomic event known as the Long Sunday Lunch. The Long Sunday Lunch was always a gathering of friends and family on the chefs’ day off. Today, this has turned into an event where anyone is welcome to join in and become part of the family gathering for an 8 course meal of heavenly food, lots of wine and beer and live entertainment. 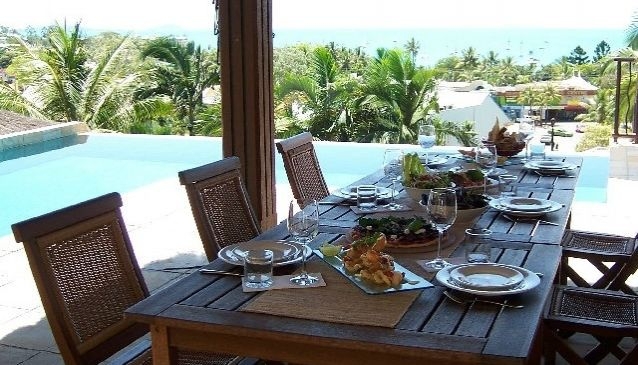 Whether it's a lazy lunch served poolside or a romantic dinner for two in the secluded Balinese hut, Déjà Vu has a menu for everyone, and with a licensed bar, extensive wine list and an espresso bar, everything is taken care of.